"In the Mast-Su area, or Palmer/Wasilla area, where I keep bees the weather is transitional from Maritime to interior weather, it is close enough to the ocean to be affected by the warm moist air coming off the ocean in the winter and close enough to the interior to be affected by the dry cold air coming from the north also in the winter. So sometimes it is warm and sometimes it is cold, it can be a pattern of freeze then thaw. Temperatures in the winter can range from mid 40 F (4.4 C.) to -30 F. below (-34.4 C.) or even sometimes colder. 1/2 inch of Urethane with foil on one side facing down is how the inner cover is insulated. Most beekeepers do not even keep their bees year round up here. Reflectix is an excellent wrap that is reusable and economical. I do believe that wrapping hives in extreme cold temperatures are beneficial but it also enables unfit genetics and right now I am breeding for cold hardiness. To much insulation can be detrimental. Right now I only insulate the inner cover to control condensation over the cluster. Reflectix has given me around 80% survival rates. I am hoping by developing genetics that I will get a better rate of survival when wrapping. 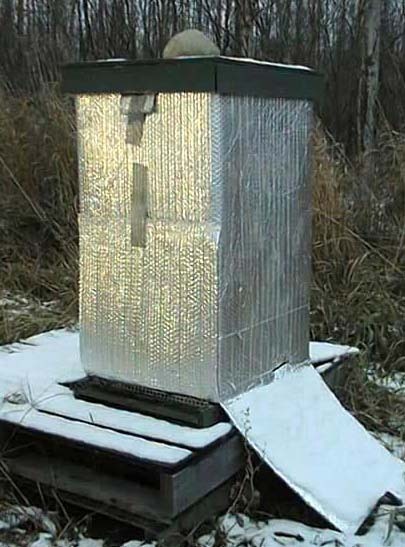 Wrapping hives is not all there is to survival, genetics also plays a big part"